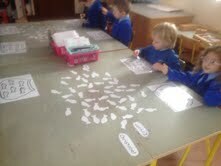 We started to play go fish. 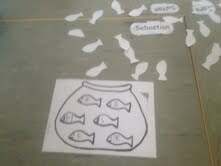 We each take turns and turning a fish over, we count the dots on the fish and match it to the number in the bowl. If we dont have that number we keep fishing until we fill the bowl with fish. e are getting very good at taking turns and helping each other in a nice way without getting angry if someone forgets how to play.